Such a long title… huh?! I love my breakfast so much! That is the best meal of the day for me.. I love it so much that we usually end up having breakfast-for-dinner more often than I would like to admit… not that I’m complaining! I had made these pancakes on one of such nights. They were so so so good! 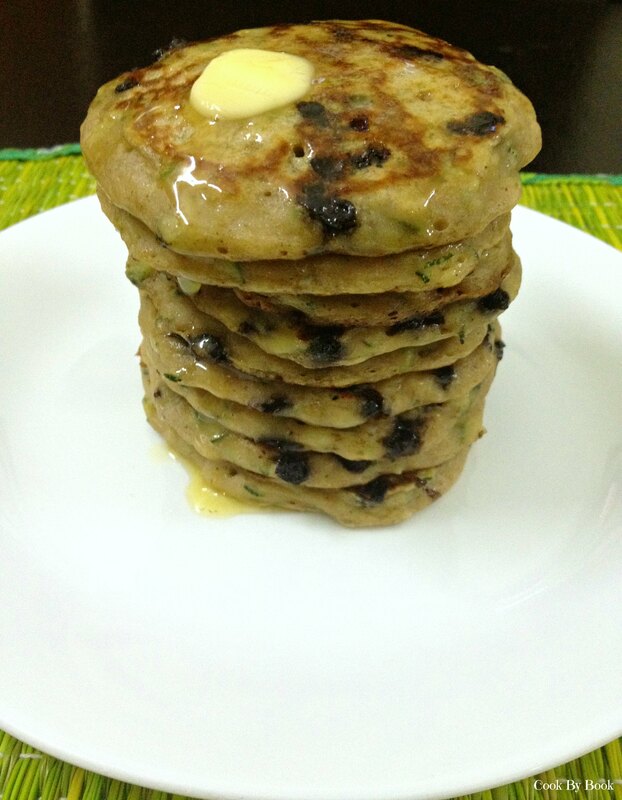 These healthy yet delectable pancakes are laden with chocolate-chips. 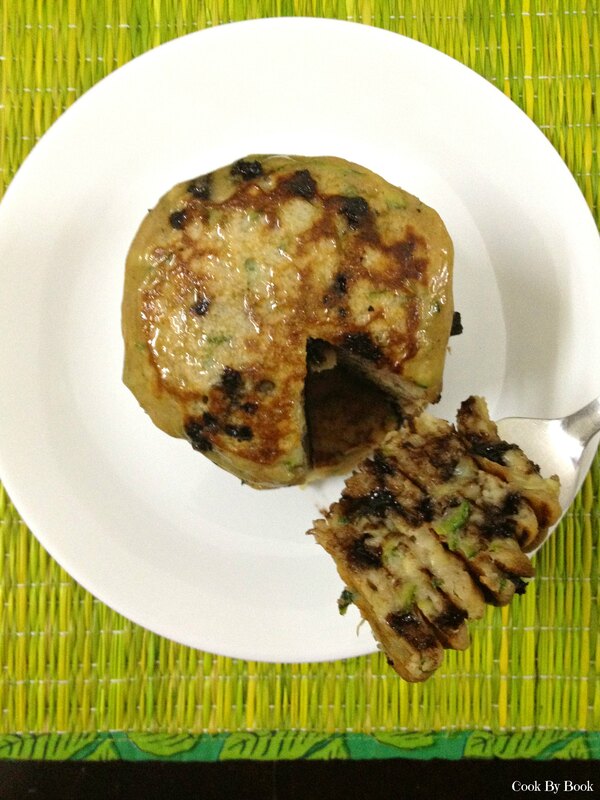 Mashed banana and shredded zucchini are folded into the batter for a nutritious breakfast treat. These taste best served the traditional way with butter and maple syrup. If you’re even more calorie-conscious then use the light butter or skip it completely but maple syrup is a must. Because there is hardly any sugar added in the batter itself. These pancakes have no eggs or butter in them. They are still quite fluffy, soft and aerated because of these ingredients ~ banana and buttermilk-baking soda. They create magic and make these pancakes possible without addition of butter or eggs. Not a zucchini fan? Worry not… Banana successfully masks the tasteless zucchini for you! 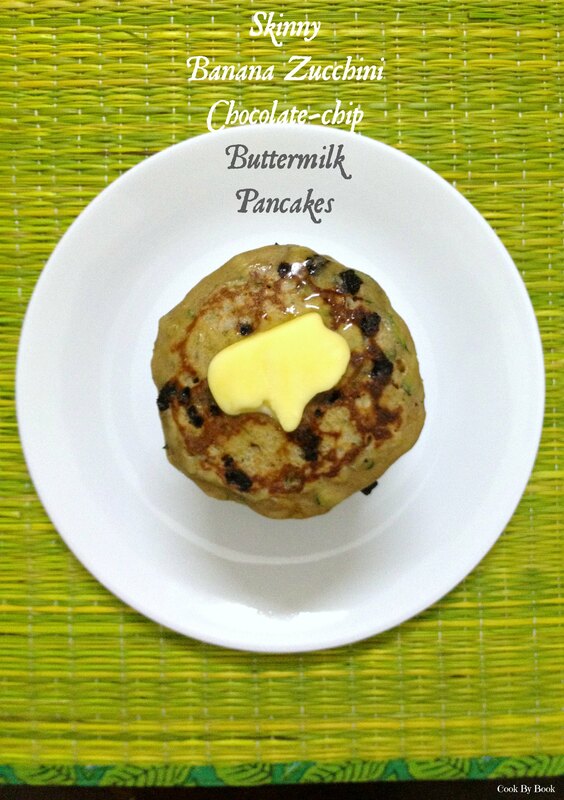 Trust me… these pancakes will rock your world! So go grab some zucchinis before they disappear! Put shredded zucchini in a cheese cloth or muslin cloth and give it a good squeeze to remove extra liquid. In a large bowl, whisk together flour, baking powder, baking soda, salt and cinnamon. In a separate bowl, whisk the mashed bananas, sugar, buttermilk and vanilla together. Make a well in the center of the dry ingredients and pour in the wet ingredients. Stir to combine and then fold in zucchini. Heat a large non-stick or cast iron skillet over medium-low heat and grease with butter. Work in batches. pour scant 1/3 cup batter for each pancake into the skillet and sprinkle the uncooked top all over with chocolate-chips. When the edges begin to look dry and cooked and bubbles dot the top, flip and cook until golden on the other side. 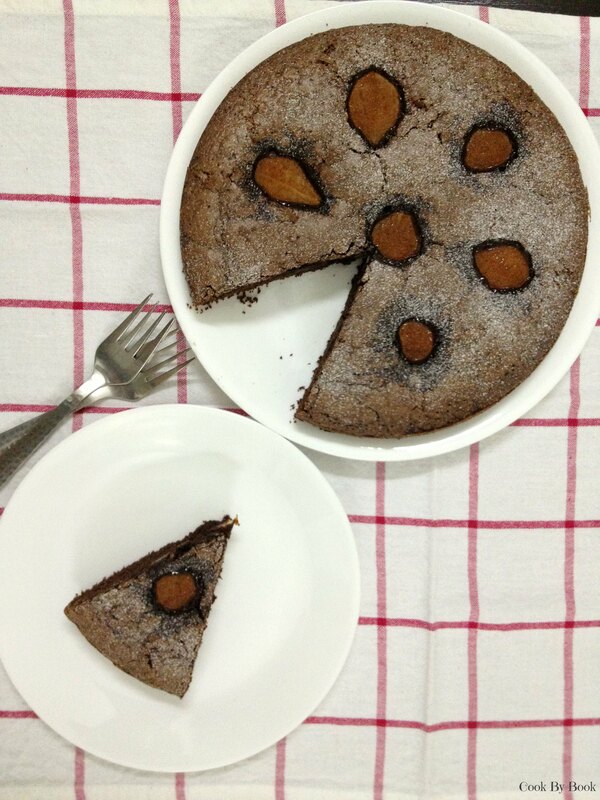 I was retrospecting and I had a simple realization… I do not have a single recipe for a chocolate cake on my blog yet! Very shocking for a chocoholic like me! This, this & this simply does not qualify. I’m a strong believer of “A chocolate a day keeps a doctor away!” And this is how this ultimate chocolate cake I’m posting today was born. The universe conspired and the stars aligned! It was not as dramatic but you can imagine how delighted I must be after I nailed the recipe. It is made with simplest of ingredients. You will have everything required in your pantry at any given day or time. Except pears. And you can substitute them depending upon what you have at hand. Substitutes are mentioned at the end of this post. 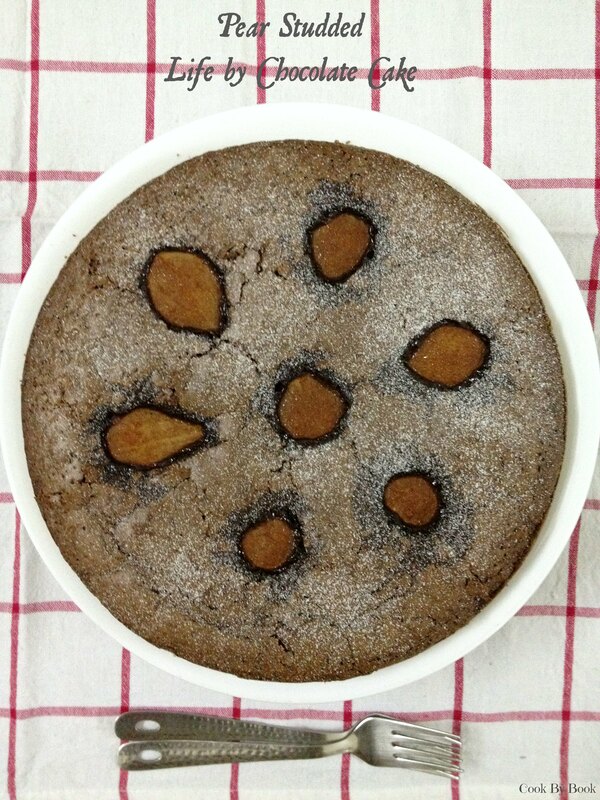 As the name suggests this cake is studded with pears. And they are not alone! Cinnamon sprinkled pears! Cinnamon enhances the pears’ sweetness and this combo is truly heavenly. You can smell the magic of Fall in your kitchen! The weather here has been just perfect for this. 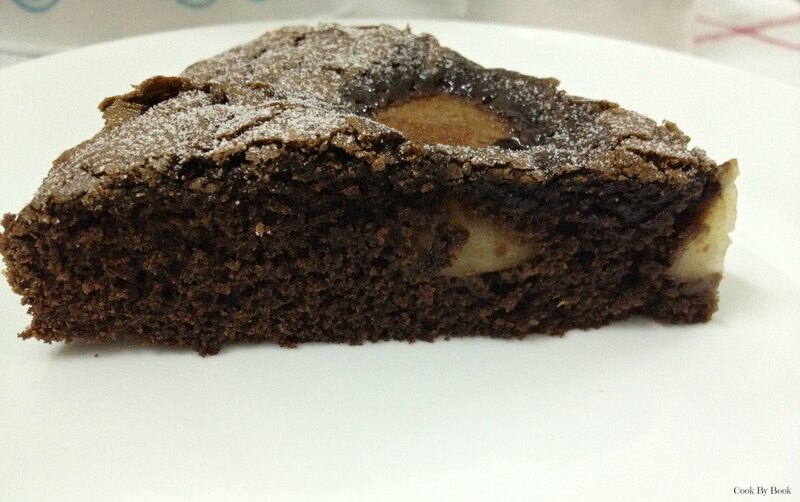 I used Red Anjou pears as that is what I had at the moment and they went perfectly with this cake. Comice pears would be excellent choice too! 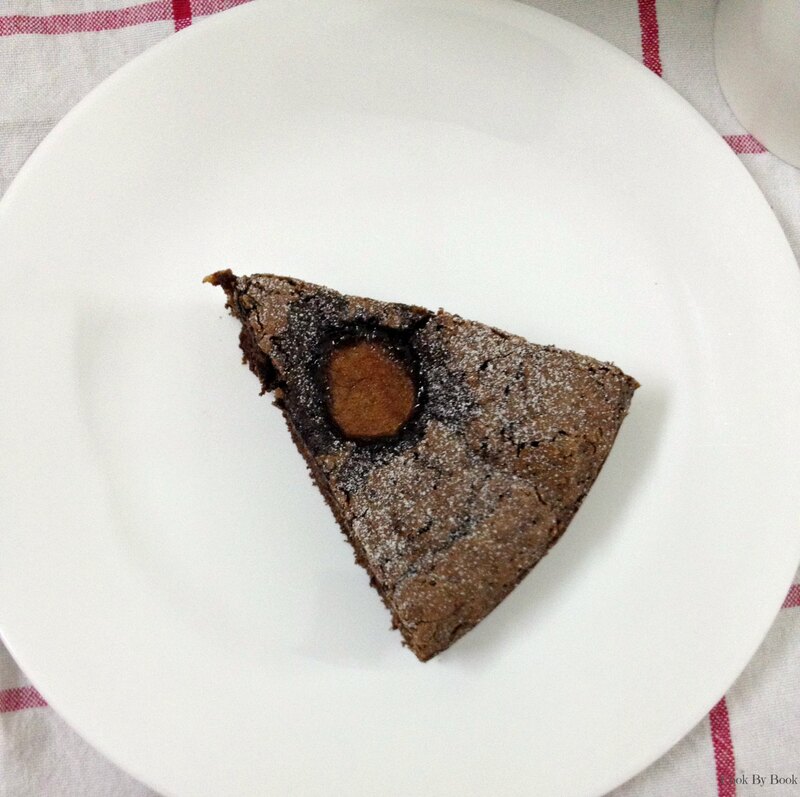 So wait no longer… You NEED this chocolate cake in your life, like RIGHT NOW!! Cut a circle of baking parchment to fit the base of 9-inch round spring-form tin. Melt 1 Tbsp butter and brush the base and sides of the tin, then line the base with the parchment and brush again with more butter. Dust 2 Tbsp of caster sugar to coat the base and sides, then tip out any excess. Preheat the oven to 180ºC/350ºF. Take roughly chopped chocolate and butter together in a heat-proof bowl and microwave it for about 1 minute or less till the chocolate has melted completely, stirring in between at the interval of 30 seconds. Whisk in vanilla extract and set aside to cool a little. In another smallish bowl, sift together flour, cocoa powder, baking soda and salt and set aside. Put the eggs and brown sugar together in a bowl and using electric mixer’s paddle attachment, beat together vigorously for about 3 minutes until you achieve a pale, aerated and thickened cream-like consistency. Turn the speed down a little and pour in the butter-chocolate mixture, beating continuously. Then slowly tip in the dry ingredients. Scrape down the bowl, gently fold in with a spatula and pour the batter into the prepared tin. Bake for 10-15 minutes. Meanwhile prepare the pears. Sprinkle the peeled, halved and cored pears with cinnamon and gently arrange on top of the cake in a circular fashion (as shown in photograph). Bake for another 23-25 minutes till the skewer inserted in the center comes out clean or with a very few chocolate crumbs clinging to it. Do not overcook. Let it cool for 10 minutes on a wire rack, still in its tin, and then ease the sides of the cake with a spatula and spring it out of the tin. Leave to cool completely or eat while it is still warm with dusting of icing sugar and a dollop of ice-cream. Notes: Feel free to substitute pears for any other fruit of your choice like raspberries, strawberries, oranges or peaches. Tastes amazing even without adding any fruit to it. I seem to have desserts ready for almost all the occasions.. I love love love sugary sweets! When the cravings hit me, it is impossible to shut my brain and there is no turning back till those cravings are satisfied. You must think I’m talking like a crazy or an addict! You’re thinking right! Not that I need a therapy or something… Just saying! It’s 1 a.m. here as I type this post, got a coffee craving which I tried to control and instead ended up snacking on a coffee-almond ice-cream! I know… weak! 🙁 But don’t judge! 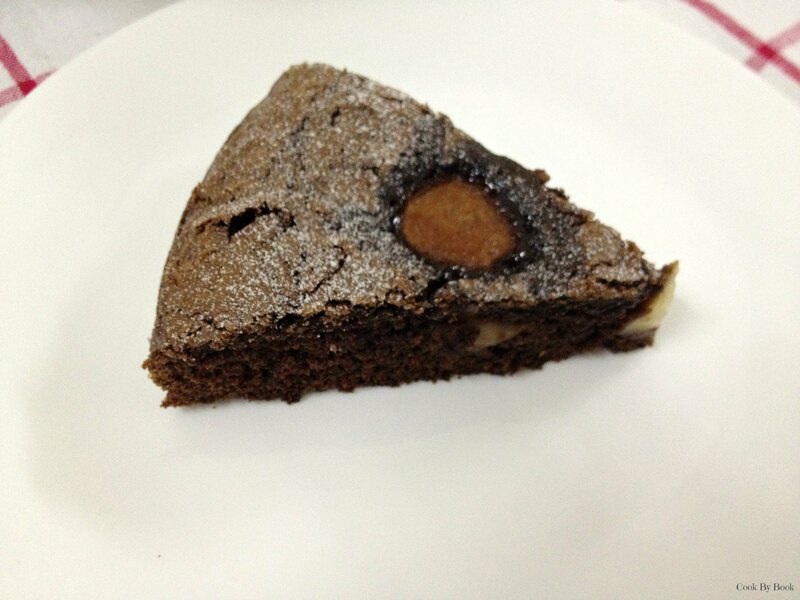 In my defense, this is the only sweet stuff I have had in a whole day! You all know I have a sweet corner for ice-creams. So much that not so long ago I even had an ice-cream week on the blog! Check this out! Crazy right?! So it would be impossible that I would let the Independence day be gone without posting a total Desi ice-cream dessert in the honor of the occasion. Kulfi is traditionally prepared by evaporating milk on a low heat with almost continuous stirring to keep milk from sticking to the bottom of the vessel, until its volume was reduced by half, thus thickening it. It is almost like eggless custard turned in to ice-cream. I’ve stuck to the traditional recipe and have refrained from using condensed milk as I somehow detest it! Okay, I sort of hate condensed milk! I guess it’s a night for confessions! Relieved! Humph.. In a non-stick/ceramic heavy-bottomed saucepan, add 1 and 1/2 cup milk and bring it to boil on a high heat. Now reduce the heat to low and let it simmer, stirring occasionally to keep it from sticking to the bottom of the vessel. Warm 1/4 cup of milk in microwave for 10-20 seconds. Add cornflour to it and mix till it dissolves completely. 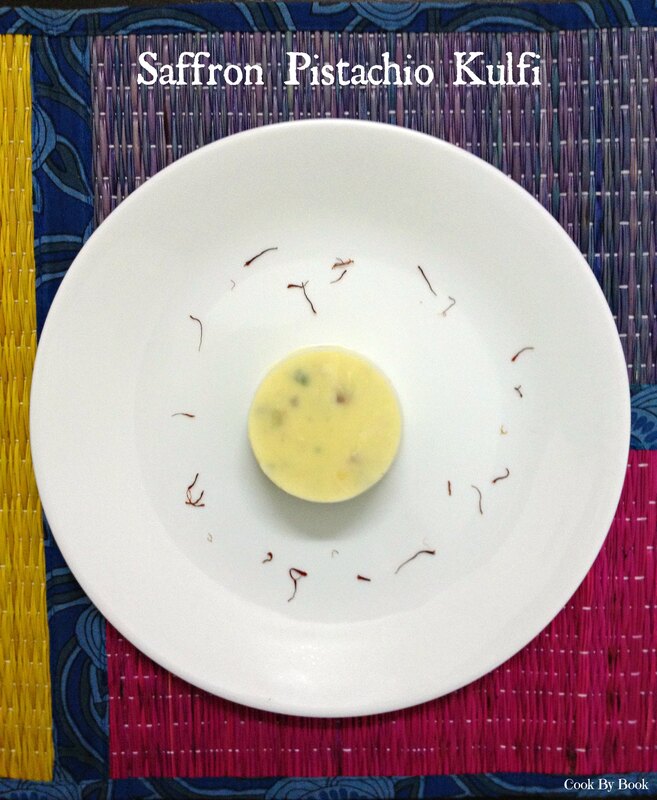 Add saffron strands to it. Separate the cardamom seeds from the pod and powder the seeds with mortar-pestle. Add the powder and pods to the milk. Let this mixture sit aside till the milk is getting reduced. Once milk has evaporated and thickened till its volume has reduced to half (in about 10-15 minutes), add the flavored milk-cornflour mixture (remove the cardamom pods) slowly to the milk stirring continuously. Add sugar and pistachio and cook for another 2-3 minutes. Taste and adjust sugar as per your preference. Remove the mixture from heat and let it cool and come to room temperature. Whip the fresh cream till soft peaks are formed. Whisk in the whipped cream to the cooled milk mixture. Pour the mixture in the molds. Refrigerate in the freezer. 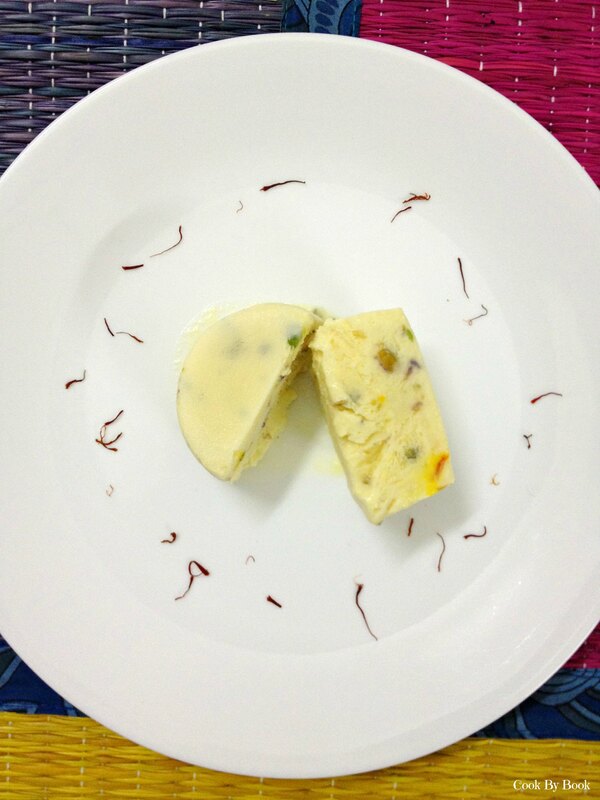 After about 1 hour of freezing, insert kulfi stick in each mold and freeze for another 4-5 hours. De-mold and serve immediately topped with chopped pistachios (optional). *You can make these without adding cornflour too. It will still taste the same but may melt at a faster rate. 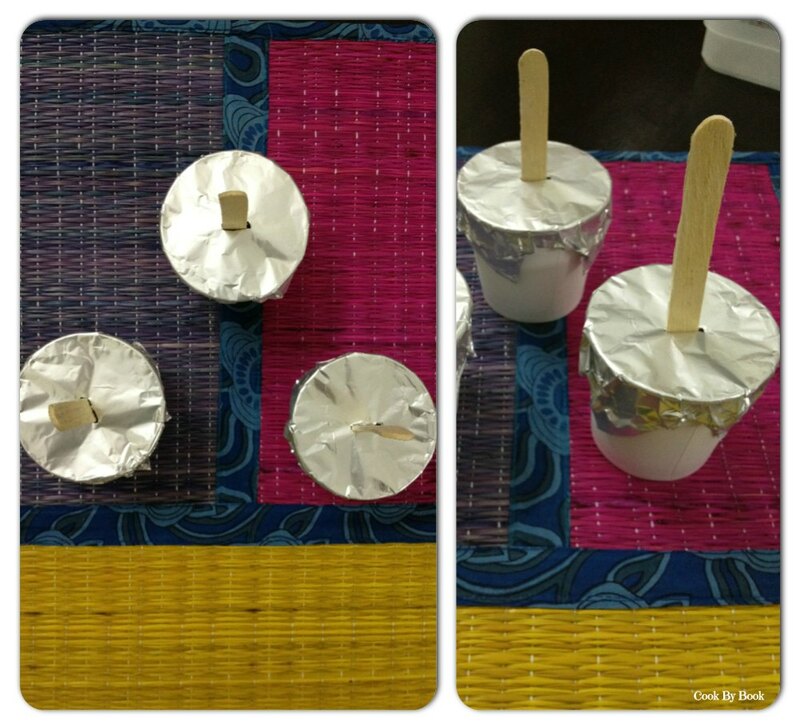 *I did not have kulfi molds hence I used paper cups covered with silver foil. To de-mold, simply cut the paper cup from one side and loosen the kulfi. *In case you’re using plastic/metal kulfi molds, dip each mold in hot water for 2-3 seconds and then de-mold the kulfi easily. 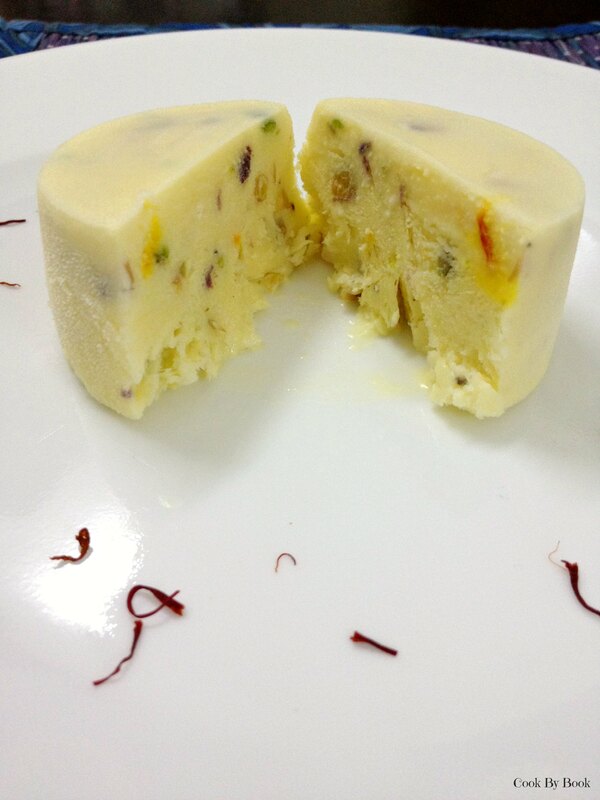 *Kulfis are best consumed within 2 days of being made. They won’t get spoiled in freezer but will become icy and rock-like if kept for longer duration.